The Peruvian district of Barranco is one of 43 districts of Lima Province, by day; Barranco is a district where you will find fun, history and tradition, Barranco is a district of Lima with great tradition and history of beautiful streets, beautiful mansions and colonial-style plazas which still breathe the air of old Lima. Since its inception, Barranco was a very attractive resort for vacationers of Lima upper middle class and foreigners in general, most of whom settled large farms and building houses. Over the years, and the increasing expansion and creation of other districts, Barranco was added to the Metropolis. 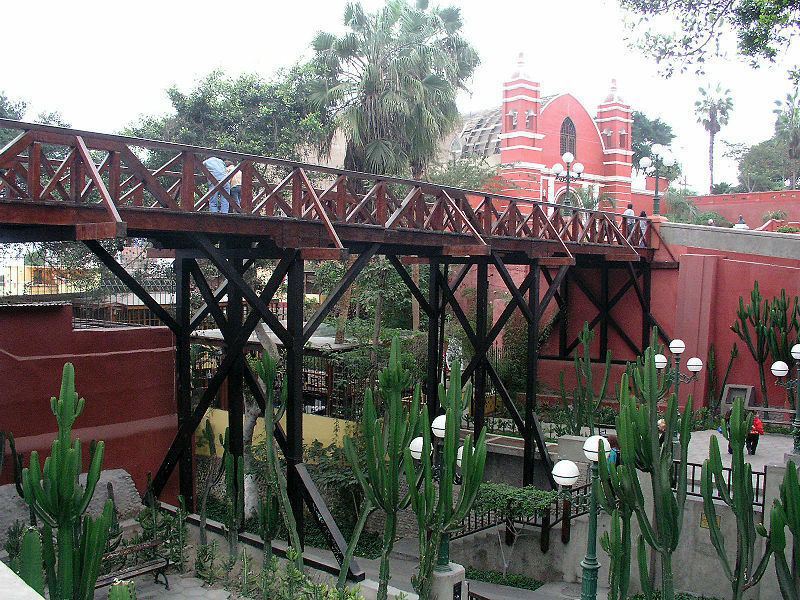 Barranco is a quiet place, of romantic walks. Its parks and squares, were, from 1913 to the 50s the most memorable sceneries of the Carnival celebrations, it used to be days of celebration and fun that many times went by various barranquinas streets. Very well remembered are the Floral Games, where he promoted art, literature and poetry. The principal attractions are the Municipal Library, Bajada de los Baños, the famous Puente de los Suspiros (Bridge of Sigh), Pedro de Osma Museum, Museum of Electricity among others. Barranco is located five minutes from the Miraflores district, is famous for its relaxed and bohemian nightlife of Lima. Barranco offers an excellent range of clubs, pubs and live shows, with all kinds of music from salsa, cumbia, and alternative rock. Also you will find interesting cultural circuit that provides rock concerts, trova, dances and concerts or Andean folk music, book, craft. Barranco has many restaurants that offer the best of Peruvian and international cuisine. You will find restaurants that offer the best of the author and novoandina food. Weekends are the busiest point of Lima, for its variety of bars, discos, clubs Creole. Both youth and adults usually go to have fun. It was initially inhabited by fishermen. Is incorporated and officially recognized as a village in 1860, naming a first Governor-Mayor. In 1874, it is officially contituited as a district, originally calling San José de Surco with its capital the Ermita de Barranco. Its first mayor was General Pedro Bustamante. * The war that was fought between Peru and Chile, where the district was looted and burned by Chilean troops. * In 1940, an earthquake of 8 ° destroys much of its historic area. The concern and commitment of its neighbors and the authorities successfully promoted its reconstruction through important joint actions. In the month of October and November, Barranco wears purple in honor of the Lord of Miracles. The procession of the Christ of Barranco Moreno takes place 61 years ago in Barranco, giving it a festive atmosphere during the four Sundays that crosses the old barranquinas streets. It is definitely the most important religious holiday of this district, by the number of pilgrims who congregate every Sunday in the processional route and especially the day of his saved. Featured in ornamentation, Danaide sculpture, venus or marble nymph is in the center of the park on a water surface. Danaide, according to Greek mythology is the generic name of the 50 daughters of Danaus also calls Bélidas for his ancestor Belas, are the nymphs of the springs in the Argolid and among the aquatic deities. There is also an Etruscan vase, original of the second century During the Hellenistic period in which is emphasized the decor of natural elements such as acanthus leaves. Two pedestals with angels called Puttis enhance the beauty of the park, all of them worked in Carrara marble. Built in 1876 and opened on February 14, its construction was to join the ends of the creek and allow passage of the banks of Ayacucho Street and the Hermitage. The Pacific war endured and saw the destruction of Barranco, the January 14, 1881, date on which Chilean troops burned the city destroying part of the temple of the Hermitage and the Bridge, so it was preceded to its reconstruction, being repaired several times. Formerly this area corresponded to a natural ravine where fishermen coming down from Surco to the beaches of Barranco. With the passage of time, the Bajada was cultivated with olive trees and willow trees which were subsequently exchanged for ficus, which persist to this day. The Bougainvillea vines with flowers fuchsia color and from France, adorn the path. On the cliffs of the Bajada were built, from the early twentieth century, beautiful ranches that remain to this day. The art collection of the Museum come from the personal collection formed by Don Pedro de Osma Gildemeister between the years 1936 to 1967. Expert in the Peruvian colonial art, Don Pedro de Osma gradually gathered around the homestead remarkable objects of varied genres and techniques reflecting the richness of Peruvian art from the XVI, XVII, XVIII, and XIX. Formerly this church was a small chapel which came humble fishermen and travelers. Its origin is confused with the legend that led to the origin of Barranco. It is said that once a group of fishermen came to fulfill his task but as it was winter and fog covered the entire coast fishermen were disoriented and lost several hours, until the distance they saw a bright light to which they went managing to reach the shore and saved. Approaching the place where it started light that had guided them, they found that it was a cross and from that time became a place of pilgrimage.